Northern landscapes accumulate carbon in vegetation and soils while rivers transport significant amounts of land-derived carbon to coastal areas. Here, we quantify carbon sources and sinks in main ecosystems (forests, peatlands, mountains, agricultural areas, lakes) in Norway for 1990–2008, and compare riverine carbon transport with terrestrial carbon accumulation in Norway’s four major discharge areas. Mean annual carbon accumulation (6.0 ± 0.9 Tg C; 19 g C m−2) in terrestrial ecosystems balanced 40 % of national greenhouse gas emissions. The area-normalized terrestrial sink strength declined in the following order (in g C m−2 year−1): tree biomass (40 ± 3) > peatlands (19 ± 15) > forest soils (9 ± 1) ≫ lakes (2 ± 1) > mountains (0.5 ± 0.3), while agricultural soils were sources of carbon (−36 ± 74). The most precise estimate in the carbon balance was for tree biomass, because of the underlying forest inventory data. Poor data on land management and soil type in agricultural soils, and on (former) drainage and peatland type resulted in high uncertainty in carbon loss and uptake estimates in agricultural soils and peatlands, which impacted the uncertainty in total terrestrial carbon accumulation. Also, carbon losses from disturbance in organic soil types were poorly constrained. 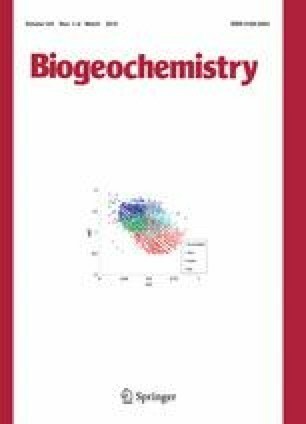 Riverine coastal inputs of land-derived organic carbon (OC) were 1.0 ± 0.1 Tg C year−1 (3.0 g C m−2 year−1), with highest area-specific riverine export in western (4.5 g C m−2 year−1) and lowest (1.7 g C m−2 year−1) in subarctic Norway. In west and middle Norway, river OC export was approximately equal to carbon accumulation in soils and wetlands, while it was 50 % of soil and wetland carbon accumulation in southeast and subarctic Norway. Lateral aquatic transport of carbon is not explicitly accounted for in forest soil carbon accumulation estimates, although aquatic fluxes represent a climate-dependent carbon loss from soil carbon pools. The lack of methods that adequately account for lateral fluxes in carbon balances adds considerable uncertainty to soil carbon sink estimates. Climate warming and associated changes in precipitation may result in substantial alterations of terrestrial and aquatic carbon fluxes, with uncertain implications for the terrestrial carbon sink of northern landscapes. Responsible Editor: Chris D Evans. The online version of this article (doi: 10.1007/s10533-014-0060-5) contains supplementary material, which is available to authorized users. This work was funded by the Norwegian Research Council projects “Terrestrial C sequestration potential in Norway under present and future climate (TerraC)” (184681/S30), ECCO (224779/E10), and by NIVA’s Strategic Institute Initiative “Climate effects from mountains to fjords” (Research Council of Norway, Contract No. 208279). This work profited from the Top Level Research Initiative Collaborative Project financed by Nordforsk (Domqua, 60501). Two anonymous referees and the editor are gratefully acknowledged.